This blog describes how to set up a high-availability (HA) Kubernetes cluster. This is an advanced topic and setting up a truly reliable, highly available distributed system requires few steps to be performed. We will go into each of these steps in detail, but a summary will help the user as a guide. Prerequisites: You should have an existing Kubernetes Cluster on Bare Metal on CentOS. It means Master1 is already configured for the cluster but we need to make some changes on existing master to create ETCD cluster. Refer to this blog to learn how to setup a Kubernetes cluster on CentOS. The above command also installs Docker and cadvisor. # Port that kube api server listens to. Only one master must be active at any particular time so that the cluster remains in the consistent state. For this, we need to configure Kubernetes Controller Manager and Scheduler. Start these two services with –leader-elect option. 5. Now Replace Master IP in /etc/hosts of all Minion by IP address of Load Balancer and restart all kubernetes service in Minions. At this point, we are done with the master components. If we have an existing cluster, this is as simple as reconfiguring our kubelets to talk to the load-balanced endpoint, and restarting the kubelets on each node. 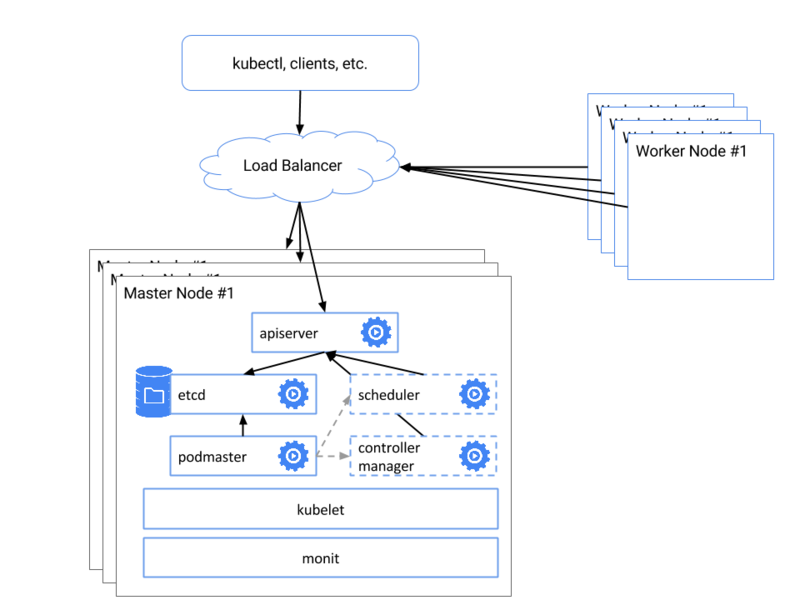 If we are turning up a fresh cluster, we will need to install the kubelet and kube-proxy on each worker node, and set the –apiserver flag to our replicated endpoint. Has anyone tested HA for ETCD? I asked this because I’m planning to put it into production. Could anyone elaborately explain how to set up a load balancer, Currently I am testing HA setup in local vagrant environment. You can easily set up HAproxy on different machine, you need only 2 cores, 1GB RAM and 5 minutes for reading tutorial. May 22 13:50:23 ha-master-03 etcd: forgot to set –initial-advertise-peer-urls flag? I have checked the etcd config several times, there are no issues with them. Would you happen to know what could be the issue? Run systemctl restart etcd on each master again.